 Which grit to use first?  When to switch to next grit?  Up to which grit? Sharpening is done on stones to establish bevel (not micro bevel). You can use flat blue Wedgek to sharpen at correct consistent angle. Sharpening is usually needed once per several months for professional heavy constant use and once per year for home use. Between sharpenings you should use honing on ceramic rod. You can tell that it is time to sharpen when honing doesn't work anymore. Honing doesn't work when edge is rolled over and has dents. Damage is done by some hard surface like bone, granite, glass, plates, metal objects like other knives, spoons, forks, etc. Honing is done on honing rod to maintain micro bevel. You can use conical orange Wedgek to hone at correct consistent angle. The honing rods are often called "sharpening steel". But while they make knives sharper, they are actually do honing and not sharpening. Honing rod is touching only very small area of the edge at the time. That is why only extremely light (feather like) pressure should be applied for honing. Honing can be done as often as you like. You can hone knife a hundred times between sharpenings. Honing restores micro bevel and makes edge very sharp again and again. Ceramic honing rods are highly recommended over rods made of steel. While steel also can be used, but ceramic works way much better. Ceramic is harder than steel. Plus ceramic grain creates perfect scratch pattern to make biting edge. Usually only 2-3 alternating light strokes per side needed to restore keen edge. We'll discuss here sharpening only, not honing. For sharpening you can use stones. There are many materials and many marketing brands for them. You can use sandpaper and lapping films pretty much as stones as well. All these stuff can have different particle sizes and measured in microns or grit. You start with more coarse grit to remove more metal. Then you use next grit that is less coarse (more fine). Use this next grit until you remove scratches from previous coarser stone. Then you move to next grit and so on. This method of using stones from more coarse to finer stones is call sharpening progression. It is not recommended to skip grits because it will take much longer time to remove scratches from coarser grit. Which grit to use first? 600 grit if knife needs minor maintenance. 400 grit if knife looks good and not damaged with visible dents. 300 grit if knife is damaged and have visible dents. 200 grit if you need to reprofile bevel to remove a lot of metal. 100 grit in extreme reprofiling cases. When to switch to next grit? With starting grit you need to sharpen all the way until you reach apex of the edge. If you don't reach apex with first grit, the next grits will be useless, they will not sharpen edge at all. Only when you reached apex, you can switch to next grit. Next grits are used only to remove scratches from previous lower grits. It takes much less efforts to use next grits after first starting grit. For example, first starting grit may need 50 or several hundreds strokes and next grits may need only 10 strokes. Number of strokes may vary greatly because of different knives, different stones and different steels. You can use 60X loope to see the scratches. Wash edge with rubbing alcohol (or Windex or water) and paper towel before switching to next grit. Washing will remove invisible tiny grinded metal particles. If not removed, these particles will contaminate next stone and significantly reduce its performance. For Practical sharpness you can finish with 600 grit to establish bevel, then hone with rod to establish micro bevel. For most practical tasks 600 grit is great. But some can finish with more coarse 400 grit or more fine 1000 grit. For Extreme sharpness there is no limit. Note: May vary by brand, country, standards, etc. Burr is a tiny thin layer of metal that is hanging over the edge apex. It is not visible, but you can feel it with fingernail (only after lower grits). It is caused by sharpening and it is perfectly normal. It is a good indicator that you reached apex and you can switch to next grit stone. But you have to remove the burr completely. Many people do not pay enough attention to proper removing of the burr. If you don't remove burr completely, you will end up with dull edge. Burr can bend from side to side. To remove burr make 5 very light strokes on one side and 5 strokes on other side, then 4 strokes on one side and 4 strokes on other side, then 3 and 3, then 2 and 2, then 1 and 1, again 1 and 1, again 1 and 1. Your mileage may vary more or less. Bevel is created by sharpening process. 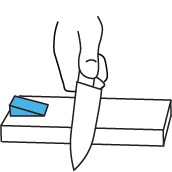 Sharpening is done on sharpening stones with many dozens or hundreds of strokes (depends on condition of knife). Micro bevel is created by 2-3 strokes on honing rod. Your edge will be hair shaving sharp after each honing. You can hone 100 times before need to sharpen again. Is it visible? Yes Not visible with naked eye. Only visible under microscope. Honing is done to establish micro bevel. 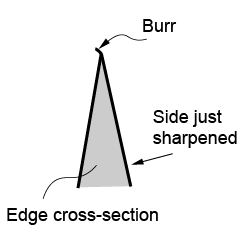 Honing angle is more obtuse (about 3-5 degrees) per side than sharpening angle. Usually only 2-3 alternating light strokes per side needed to restore keen edge. For honing ceramic rods are highly recommended over steel rods. You can use stone as well. If you take care of knife, you can hone 100 times before you need to sharpen again. Sharpness can be Extreme or Practical. Extreme sharpness is great for razors and other special applications, but it doesn't last for a long. It can be used only for delicate tasks. Extreme sharpness is done by shapening progression well above 1000 grit with polishing and stropping at final steps. Practical sharpness is not as sharp as Extreme. It can shave hairs, but not as good as Extreme. But it is superior to slice tomatos, cut meat and vegetables. It is great for kitchen, hunting, meat processing and everyday tasks. To restore sharpness just hone it periodically. You can hone for many months before you need to sharpen again. And it will shave hairs after each honing!